5 Great Reasons To Get Running In The Dirt! 09 Aug 5 Great Reasons To Get Running In The Dirt! I live in a city and teach outdoor fitness classes and so I generally get plenty of outside time, but it is not quite the same as time spent outside exercising in nature. And while I love the vibrancy of the city and the outdoor playground it offers, I need to escape from it at least once a week to refuel my soul. My liberation comes in the form of trail running. Over the bridge and to the mountains I go! Trail running has some pretty major pluses. Below I’ll list just 5 of them. There is a lot to be said for getting out of the daily grind of life and unplugging in nature. The ever-changing terrain of trails calls for you to concentrate your attention on the task at hand and not on the problems you left behind in your daily life. Your breathing becomes melodic as your run settles into a rhythmic pace taking in the sites and sounds of nature and before you know it you are operating solely in the present moment. Most trails have some form of elevation gain and almost all of them have uneven surfaces, which can have you jumping over crevices, side stepping fallen branches or maneuvering protruding roots. This lateral navigation and the little leaps used to negotiate the changing terrain help to build and activate your glutes and the smaller muscles of your calves and feet. The uphill grades of a trail will also recruit and strengthen the muscles of your glutes and your calves, as you use them to power up the hill. A steep downhill will help to strengthen your quadriceps as you use them as a braking mechanism to stop yourself from careening down the hill too fast. You’ll be sure to feel your quads after a steep fast downhill. Your proprioception is sharpened (your sense of where your body is relative to other people and objects), and your balance is improved by running in the dirt. 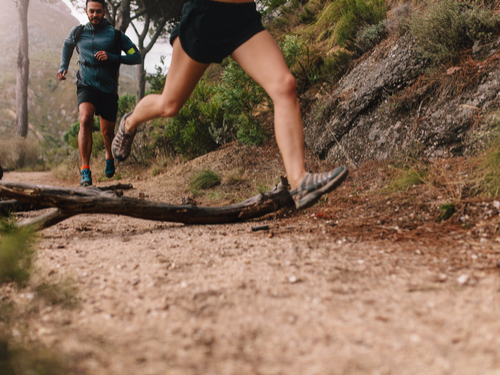 Trail running requires you to be aware and if necessary dodge low lying branches, and maneuver over fallen trees and rocks strengthening your balance as you negotiate the ever-changing uneven surfaces of the trail. Each foot strike on the rough terrain requires the recruitment of the smaller stabilizing muscles of the legs, ankles and feet to keep you from tripping or rolling an ankle on rogue rocks or roots. Dirt surfaces are much softer than pavement and that softer dirt equals less stress on your joints than the hard surface of pavement running. Repetitive stress injuries caused by running at the same pace and foot strike can be staved off by the softer surface and changing terrain. Trails inherently require you to be constantly repositioning your footfall, as they generally don’t follow a straight path and usually have many different small obstacles to contend with. The dirt allows your feet some cushioning as they connect with the ground each step of the way. Trail running gets you out in the fresh air amongst the grass, wild flowers and wild critters. Fresh air, scenic views and critter spotting keep your mind occupied in a positive way. The air is clean, the lighting always different depending on the time of day and the scenery ever changing. One day you may see nothing but the grass blowing in the wind while another might yield a bunny, hawk or bobcat sighting. Depending on your location of course. You never know what you will see. Even a butterfly can bring about a moment of delight. I consider it a moving meditation. If you haven’t tried trail running, consider going out for a short run in the dirt to see if it warrants further exploration.